TheGunBlog.ca — The SHOT Show range day for military and law enforcement yesterday was the quietest I experienced in the three years of attending the world’s biggest trade expo for the firearm industry. That made it quicker to try the gear on display and easier to talk to the company reps. The rest of this week is at the convention centre. Below is how I experienced Range Day. Turnout. It felt like one-third the attendees of 2017 and the least exhibitors since then. One organizer told me weather forced airport closures in some regions and prevented exhibitors and visitors from making it. I asked several people if the U.S. government shutdown blocked federal agencies from attending. Nobody thought so. One person said the organizers were being more strict about who they let in. Weather. Windy, and cold. It was 10-ish degrees Celsius on Jan. 21, before windchill. I was used to sunshine and no wind, and was underdressed. Distance. No long shots for me this year. My furthest target was 738 metres (807 yards), at the Leupold station, shooting an Accuracy International rifle chambered in .338 Norma. Targets. All the targets I aimed at were static E-silhouettes (torso plus head), except for a few shooting trees and one steel disc. Attendees. Military, police, law enforcement, security/defence contractors from around the world. Joy. I love guns and I love shooting. I desire every piece of gear I tried, and more. I feel lucky to try equipment from some of the world’s most-prestigious manufacturers. SHOT Show is my Wonderland. Scopes. I still don’t feel confident running a scope. I still want to change that. (I made the “turrets vs Tourettes” joke last year. It still holds.) All I had to do in most cases was point at the centre of the target and press the trigger. The staff handled all the settings and spotting, and offered instructions for any holdovers. New Learning 1. One of my takeaways: I spend a lot of time worrying about aspects of equipment that may not matter that much. This occurred to me after firing the Glock 17 Gen 5 pistol for the first time to test the Aimpoint ACRO P-1 red-dot sight. I was so focussed on everything else (the sights, the targets, smooth and fast transitions between targets, the people around me, …), that I forgot to pay attention to how the trigger felt compared to my Gen 4. So all my obsession over trigger differences ended up being a non-issue. Conclusion: For a lot of uses, “good enough” is good enough. Corollary: Good gear matters. In some cases, it matters a lot. Update 24 Jan.: New Learning 2. Good gear lets you forget about the gear. That’s how I felt on these guns, scopes, sights, ammo. The equipment is so smooth it becomes invisible and unnoticeable. It works, no distractions. Point and shoot. (I realized this the next day when handling a new USD 2,400 rifle in the show hall. It had a sticky, wobbly bolt that I noticed every time I ran it. That takes attention away from the task of hitting the target.) This sounds like a contradiction of the point above. Sometimes “good enough” isn’t good enough. Like when you’ve been spoiled with the best. Location. Nellis Air Force Base – Small Arms Range, about a 20 minute drive from the Las Vegas strip. Accuracy International, a leading maker of sniper rifles, didn’t have its own booth at the range day, but Leupold, Schmidt & Bender and others had their scopes mounted on AI rifles. I spoke with Scott Siegmund, Vice President for North America, at the Schmidt & Bender shooting station. I asked how his rifles ended up being used by S&B, and about the market in general. Remington of the U.S. leads by market share in sniper rifles for law enforcement (LE) in North America, partly because they are less pricey. The market has also expanded and changed with new competitors, he said. AI and Sako (now part of Beretta Holding SpA) were the big names for high-end rifles in North America 5 or 10 years ago. Today there are more, including Cadex Defence of Canada. AI designed the rifle it submitted for consideration to the U.S. military’s Advanced Sniper Rifle (ASR) program based on its experience competing in the Precision Rifle Series, he said. The company’s ASR has a flat bottom forward of the magazine well and can be quickly mounted on a tripod. The design also makes it easier to stabilize on or against supports such as posts, trees, boulders or rock mounds. In the real world, you don’t always get to shoot from prone on a flat surface, Siegmund said. “We’ve incorporated a lot of things from competition,” Siegmund said. I got to shoot their new ACRO P-1 red-dot sight, their first specifically for pistols. They’ve had rifle models for decades. They introduced the S-1 for shotguns last year. “We wanted something that can handle the slide movement on a pistol,” an Aimpoint rep told me. “That’s always been the problem. The pistol is the worst of any” firearm, including shotguns, for putting stress on sights. While other companies make pistol red-dots with a lifespan of 5,000 rounds or so, Aimpoint tested various ACRO sights with more than 20,000 rounds in a single session, without issue, the rep said. They wanted it to run for an unlimited number of shots, he said. 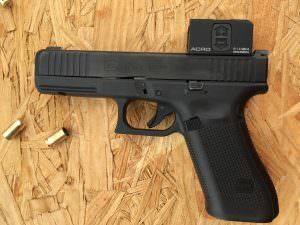 I got to shoot the ACRO mounted on several firearms, beginning with a Glock 17 Gen 5 pistol in 9 mm. I hit almost all of my targets spread across the range from standing, using both hands and shooting at targets about 7 m to 20 m away. The Aimpoint rep suggested increasing the brightness of the dot one or two levels brighter than what felt natural, to draw the eye to the dot. Result: Easier focus, greater certainty, quicker shots. Almost all of my handgun experience (less than 10,000 rounds since I got my PAL in 2012) has been with iron sights in daylight. I think Aimpoints are superb, I shoot well with them and without them (“well” for me, not the Olympics or the Canadian military’s JTF 2), I want to get better, I keep hearing that red-dots are the future. But I’m not there yet. I don’t like to depend on batteries for survival gear of this type. 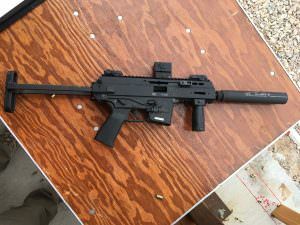 After the Glock, I tried the ACRO on a B&T APC-9 semi-auto carbine that used 9 mm Glock mags and had a B&T QD suppressor. Heavenly. Wolverine Supplies, one of Canada’s largest independent gun stores, sells the gun for $3,215. Last ACRO: The B&T MP9 with a folding stock, unsuppressed. It belongs in my pocket. The sight has a suggested price of USD 660, Guns & Ammo magazine said in a review last month. That excludes the cost of the mounting plate. Then an Aimpoint CompM5B with a magnifier on a B&T APC223 rifle in .223 Remington. Front heavy, but even less recoil than a standard AR-15, if that’s possible. Update 22:10: Aimpoint shared good info on the ACRO in this video by InRangeTV, which sees several advantages with the new optic over the Leupold DeltaPoint and Trijicon RMR. The Vermont-based manufacturer told me they are the biggest maker of AK-47 rifles outside China, and one of the top-five in the world. The first model they placed in my hands was a stamped-steel receiver AK, the RAS47 in full-auto and semi-auto chambered in 7.62 Soviet. They offered Magpul PMAG magazines and a Vortex Sparc red-dot. I shot from standing at targets from about 7 m to maybe 100 m.
Next I tried the milled-steel C39 in full-auto and semi-auto using a Vortex Strike Eagle scope. Stamped receivers are lighter and flex more, while milled receivers are heavier, more rigid and often feel more solid to shoot, the Century Arms rep said. The AK-47 is the most-popular rifle in the world, and perhaps the most rugged and reliable. It’s a symbol of communist evil. In Canada, where I live, the police can put you in jail for having an AK or even a standard 30-round AK mag in its original packaging. How could I not desire these guns? My last gun of the day was my first time on the Kriss Vector rifle. It was a 9 mm model in semi-auto, two-round bursts and full-auto. I shot with a red dot at targets 7 m to about 25 m. Super easy, soft and fun. I shot their Mark 5HD 3.6-18×44 rifle scope, mounted on an Accuracy International AX model in .308 Winchester. The scope is listed on the website for USD 2,340. A few shots from prone at an E-silhouette about 300 yards (274 metres), then out to 560 yards. The wind had died down, but it was still gusty at times. I was making maybe half my hits. I was on the gun for 10 minutes, if that. But that was enough for me to notice my neck starting to kink. I don’t shoot often, let alone in prone. My muscles need some attention. I wonder if I can find a hot tub and a massage in Las Vegas. 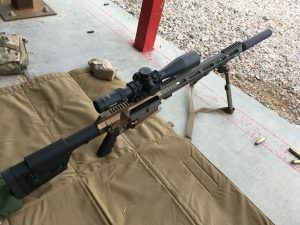 Then I moved over to Leupold’s Mark 5 5-25×56 scope mounted on an Accuracy International Advanced Sniper Rifle in .338 Norma, with a Thunder Beast Arms 338 Ultra SR suppressor. The setup was smooth, clear, quiet. From prone, target at 738 m. It took several adjustments, guidance from the expert staff, and a handful of shots to hit the target and set my distance record for the day. My only belt-fed light machine-gun of the day: Ohio Ordnance Works’s M249 Squad Automatic Weapon (SAW) in 5.56 NATO, shooting with a Vortex red-dot sight at an E-silhouette 100 m away, from prone. No home should be without at least one of these. I shot from prone. The gear was overkill for a steel disc about 150 m away. But that was the only target available because the 50 km/h wind gusts had knocked down all the others. I didn’t get to try the 1-8×24 PMII ShortDot Dual CC scope this year. I loved it last year on an AT308. This time it was mounted on an FN-SCAR. I asked Jörg Hennemann, the company rep, why he picked Accuracy International to demo his scopes. Hennemann also said that a lot of people were asking if the ShortDot Dual CC worked on a SCAR, so he decided to let them see that it did. 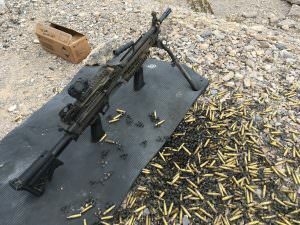 Shooting Sword International’s MK-18 piston-driven AR-type rifle in .338 Lapua Magnum was my biggest surprise of the day. I didn’t know that calibre existed in an AR platform. I shot using a Steiner Military 5-25×56 scope, an OSS suppressor and a CMC trigger set at 3 pounds, i.e. light. Again it was overkill for a target at about 150 m, but fine for me and the only target that was available at that point. Low recoil. Low noise. No bolt to run. Pure pleasure and ease. The spec sheet says the 13.25-pound rifle can shoot 0.5 minute of angle (MOA) and should retail for about USD 7,000. S.W.O.R.D stands for “Special Warfare Operations Research Development.” The company makes several piston-driven ARs in 9 mm, 5.56 NATO and other calibres. A rep said some U.S. military units are using its rifles on operations, without saying which units. Why would he consider jumping through the regulatory hoops and modifying a gun to access Canada’s tiny market? “We want to support Canadian gun owners,” Elrod said. See all my SHOT Show coverage here.